The 'Claim your prize' system offers a direct way to communicate with the winners of your Facebook and Twitter sweepstakes with the aim to provide administrators with an easier way to manage the communication with the winners that have confirmed their prize. By enabling this system, winners have a direct and ordered way to confirm that they accept the prize, and leave their personal details so that the sweepstakes organizer can then contact them and process the delivery of the prize. Note: the system is currently available for the following apps: Facebook sweepstakes, Twitter sweepstakes, Instagram Sweepstakes and Youtube sweepstakes. It is also available for Pick-a-winner app if the list includes the email of participants. How do the winners claim their prize? 1. Once you have obtained the winners and prepared the page to announce them, share the winners page link on social networks. By clicking on the Menu at the top of the page, you'll be able to see all the screens that conform the 'Claim your prize' system. You can edit the texts of each screen to adapt it to your sweepstakes. 1. Welcome page. You'll be able to change the image, description and the label for the 'Claim your prize' button. 2. Entry form page. 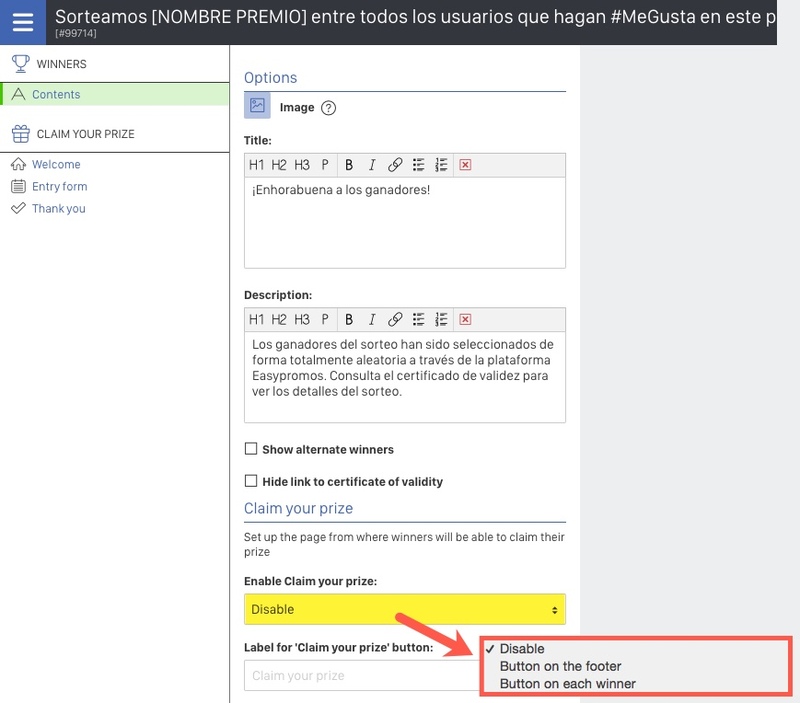 You'll be able to change the image and the text that will be displayed at the top of the page, as well as set up the fields that you'll need to request winners their information in order to manage the delivery of the prizes. You can add all the additional text fields you need, as well as drop-down lists and opt-in fields. On claiming. You can write the text that you want to communicate to the winners that have claimed their prize and have completed the entry form. Without prize. You can write the text that will be displayed to non-winner users that click on the 'Claim your prize' button. Already claimed. You can write the text that will be displayed to winners that have already claimed their prize and click the 'Claim your prize' button again. Manage winners. It allows you to check the status of all the winners (if they have claimed the prize, their contact details, and export all the information into an Excel file). 'Claim your prize' page. When enabling this system, you'll see the URL to the landing page of the Claim your prize screen, which you can use in order to communicate directly this link with your users. When enabling the 'Claim your prize' system, the button to the Winners page will be automatically displayed in order to access the system. 1. Access the Editor of the Winners page. 2. You'll see the section 'Claim your prize' that it is pre-configured with a type of button displayed at the bottom of the page, together with a text that you can customize. You can also edit the label of the button. Disable. If you have not activated the 'Claim your prize' system yet. In this case, the functionality is disabled and the section will be displayed as closed. Button on the footer. The 'Claim your prize' is activated and will be accessible from a unique button on the footer of the page, as shown in the image above. How to share the Claim your prize screen with the winners? 1. Share the winners page with the 'Claim your prize' system enabled. This page will already display the 'Claim your prize' button, so that when the users come to this page they will be able to use this functionality. 2. Share the direct URL to the 'Claim your prize' screen so that participants can check if they have won the prize and confirm their contact details. This link can be useful to send it to a more specific public or channels. Note: If you want more information of how to notify winners of a sweepstakes carried out via comments on a Facebook page, visit this link where we indicate step by step how to contact them.